Pilgrimage of the LHM to Olón, Santa Elena (Ecuador), on November 15, 2015. On a natural cliff over the Pacific, near the fishing village of Olón, the Swiss priest Othmar Stäheli built a shrine dedicated to Mary under the advocation of the White Star of the Sea. Located between Olón and Montañita, the Shrine has the form of a sailboat anchored on the edge of a natural gorge, where you can see a wonderful panoramic view of the sea. In the crypt that is beneath the Church there is an image of Mary the Mystic Rose, who on November 11, 1990 wept tears of blood. Many people have found body and spiritual healing in this place. 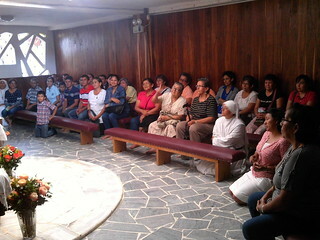 The Lay Members of the Home of the Mother of Chone and Playa Prieta (Ecuador) went there on a pilgrimage on Sunday, November 15. 1.- Reparation for the offenses to the Lord by women religious who betray their vocation. 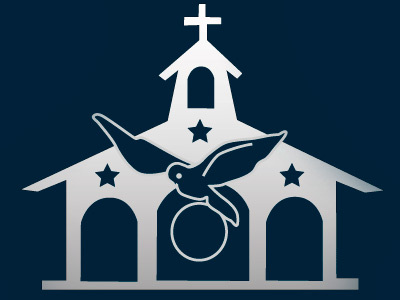 2.- Reparation for the offenses to the Lord by women religious living in mortal sin. 3.- Reparation for the offenses made to Our Lord by the Priests who are like Judas- and pray, in particular, for the sanctification of all priests. With this message we stayed praying in the Chapel, next to the Blessed Sacrament and the Virgin Mary. In the afternoon we were able to pray the Rosary right there and have another intimate moment with our Lady. We returned home with a heart full of love for Our Mother and full of gratitude for the many graces poured on each one of the pilgrims.